We look forward to welcome you in our home! It is an old home, which was recently fully renovated from top to bottom. 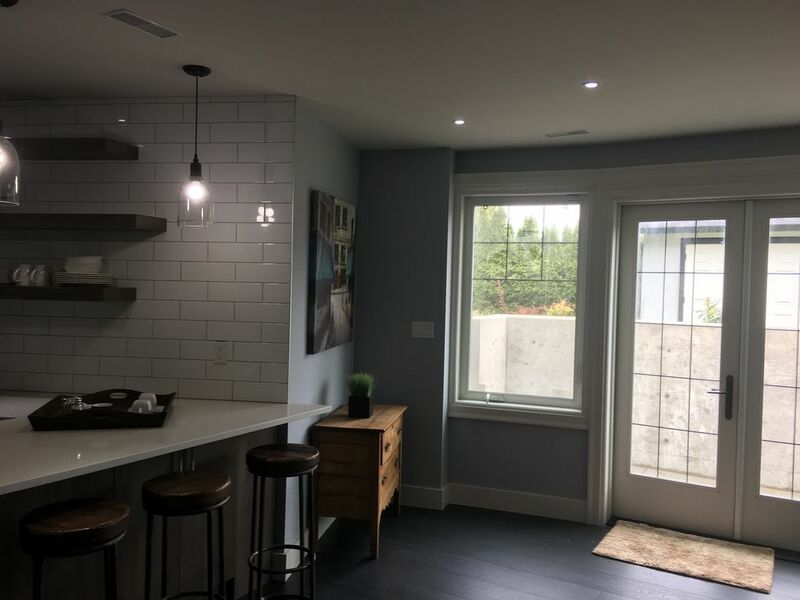 The room is located in the basement with a double French door walkout entry, so you will have your own separate entrance from the main home entrance. There are large windows and plenty of day light. A small kitchen is available with a microwave, dishwasher and fridge. It is a bright space, with the minimum you need to be comfortable. The place is sanitized after each guest. You will find some breakfast tea, coffee and snacks when you first arrive. You will have your own private bathroom and shower. A lockbox holds the key so you can access the room whenever you arrive. Cadboro Village is just down the road and has a grocery store, pharmacy, pub, Thai Restaurant etc. Cadboro/Gyro Park at the bay is also close by. The room is located in the basement with a walkout entry, so you will have your own separate entrance from the main home entrance. The room is furnished with a queen bed, sofa and TV/android box. We will likely run into each other occasionally in the back yard and patio. If you are missing anything, you can always reach us. We love the community and are available for questions or help you find your way around places. We will respect your privacy and let you enjoy your time. You are welcome to enjoy the patio space and large backyard. Cadboro Village is just down the road and has a grocery store, pharmacy, pub, Thai Restaurant etc. Cadboro/Gyro Park at the bay is also close by. We really loved our stay in this lovely suite! It was spacious, modern, bright, and quiet. We'd never stayed in the Oak Bay area before and loved being able to explore a part of Victoria that was new to us. There were great beach areas to walk to (Cattle Point, Willows Beach) and just walking through the residential area around there was so beautiful. Lots of little shops and restaurants within walking distance, or a very short drive away. Aida was a very caring host, and we had everything we needed for a most comfortable and relaxing stay. We would highly recommend this rental for exactly those reasons! Beautiful clean and quiet suite suitable for a couple. Great area to go walking in. Aida's place is located on one of the best stretches on the island. The accommodation itself is spotless and better than the pictures. Wake up to a wonderful sunrise. Sometimes deer and rabbit in the yard, wow so nice to see... gyro park near by groceries at a walking distance and a super hostess ! Couldn't ask for more. This property is in a very affluent part Victoria and the accommodations offered match the neighbourhood with all the comforts of home. The owner (Aida) lives there and was very attentive to any questions or requests we had. It was her goal that we have a good stay. If you’re an outdoor person, there are lots of dedicated walking/biking paths and trails in the area. Essentials like well stocked grocery and liquor stores are within a 10 minute drive. Cultural activities, museums, restaurants, etc. can be found in the very vibrant downtown, a 15-20 minute drive away. We will definitely stay there again. Thank you for the great review! Wishing you a happy new year and all the best, until next time. Feel free to check on availability next time you are in Victoria again. Wonderful location, close to UVic and beaches. Beautiful well-appointed suite, modern, comfortable and bright. The owner was lovely and very accommodating, which was much appreciated. Would not hesitate to recommend!